Are you due to sit a NEBOSH exam? If so, this new series of NEBOSH question and answers posts is for you. Using our experience of delivering training we look at questions found in NEBOSH past exam papers to guide you towards NEBOSH answers par excellence! Here we look at a question similar to those that appear in NEBOSH General Certificate past papers. Worth 20 marks in total, the question is divided into three parts with the marks available for each shown in brackets. This immediately tells you that in order to gain the maximum 4 marks available they’re not looking for an exhaustive description, just an outline. In terms of the answer itself, you should first recognise that the accident was reportable under RIDDOR since the injured visitor was taken directly to hospital. As such, the responsible person within the organisation should notify the authorities by the quickest practicable means, (be it phone, fax or e-mail) and follow this up with a written report on a F2508 form within 10 days. You can answer a four point question in a brief paragraph, but not bullet points and I’d advise against anything too lengthy or wordy as really you ought to be looking to pick up the necessary points and move on. Plan your answer carefully so that you don’t bounce around the question answering a bit here and a bit there. As the question is divided into two parts you should follow suit by answering in two parts, in order, with each part clearly labelled. This question is asking for specifics on the employer, and then on the supervisor so keep your answers in the same order; it makes it easier to mark! Also remember that NEBOSH exams are positively marked, which means that the examiner is actively looking to award points for correct answers, rather than deduct points for incorrect answers. More details on this can be found in our NEBOSH exam tips post, which I’d recommend to anyone taking these exams. 1bi) When answering the first part of the exam question you should explain that the employer has a general duty of care under section 2.1 of the Health and Safety at Work etc. Act 1974 (HASAWA). That duty is to ensure, as far as is reasonably practicable, the health safety and welfare of its employees. In this scenario the employees were exposed to the same risk as the visitor. Under section 2.2 of HASAWA there is a further duty owed to provide a safe place of work, safe access and egress, a safe working environment and adequate supervision, information, instruction and training. In this example, as it was a non employee that was injured, section 3 of HASAWA has been breached. This section states that the employer has an equal duty of care to ensure that persons not in his employment should not be exposed to risks to their health and safety. This might seem like quite a bit to cover but with 10 marks at stake it’s worth taking the time to do so! Well known acronymns (such as HASAWA, DSE etc.) can be used. 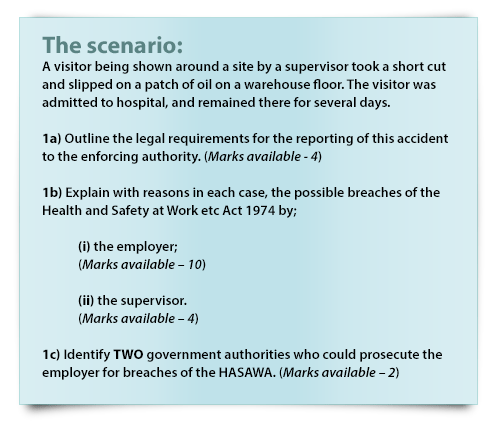 1bii) The second part of the NEBOSH exam question relates to the supervisor and so you should make the point that they could be held in breach of section 7 of the Act for failing to take care for the health and safety of themselves and others who could be affected by their acts or omissions. Further marks could be gained by mentioning sections 36 and 37, if it could be shown that the supervisor might be held responsible for the breaches of section 2 and that these breaches were due to their act or default, and if the supervisor fell within the category of officer as mentioned in section 37. (Remember that in smaller companies a supervisor may well also carry managerial responsibilities). Then use this to inform the level of detail you go in to, for example, you would provide more information for a question asking you to ‘outline’, than one asking you to ‘identify’. In this instance there are two marks available, but although it’s reasonable to assume that you can earn these by naming the two relevant authorities requested, it is worth including more if you can as this way you’ll be demonstrating the ‘breadth of knowledge’ that NEBOSH examiners seek (something that could earn you a valuable few extra marks overall). So that’s it, the first NEBOSH past paper question and answer guide in our new blog series. I hope that you’ve found it useful and if you get chance please remember to comment – be it to share your own tips or to suggest future questions for analysis. If you’d like to follow this NEBOSH past papers series and be automatically notified when further example exam question answers are added, complete the ‘follow this blog’ option in the top right. Thanks for the explanation,I failed the IOG exam twice,now your explanation give me an idiea that how to pass the exam. could you please blogged some other technical questions. Hi Momand, great to hear you found the information useful. We will be posting more hints and tips shortly so keep an eye! If you go to http://www.rospa.com/safety-training/work/iosh/ you can view all our IOSH courses on offer. Sadly we do not deal with job/job salary.